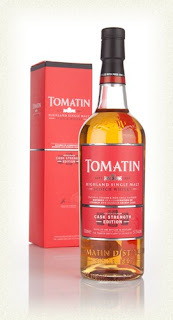 Ben's Whisky Blog: Some new Tomatin! I’m a long term fan of Tomatin and it’s because the whisky is so solid. It’s not flashy (not always anyway, not until it’s over 30), it’s not extreme. It’s elegant, robust, balanced and it gets you right in the malt centre of your hind-brain. And the Cu Bocan (lightly peated, NAS) malts are becoming something of a sleeper hit for me. Great news! Here’s some new Tomatin! These two are OB and show (respectively) solid house style and some serious flair. 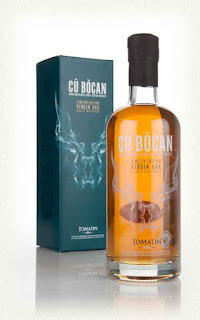 In the next couple of months we can expect some more – another Tomatin and the third cask variation in the Cu Bocan series. Nose - Bright, sweet fruit. Sour oak. A dark, meaty backnote (charred pork crackling). Dusty mineral and pepper. Classic young Tomatin with something a little more interesting on top. With water, the sourness recedes, bringing out more sweetshop - tiny, brightly colour boiled sweets and refreshers. Body - Sweet, sharp and waxy - quite hot actually. Kumquat? Great engine notes. I'd swear this has some small element of peat in it. Numbing, oily oak. With water, more structural peat, cigarette tobacco and lovely wax. Much more balanced with water - hey they should let this down with a bit before they bottle it! Beautiful juicy fruit balanced by engine block and a touch of sulphur. Finish - Long, balanced, juicy and glazed. With water, quite tannic, compelling. What's not good about it - Not the world's best integrated whisky. Neat, the nose is a bit sour and young at first but give it time. The delivery is slightly awkward - spiced and sweet out of kilter. But this all tones down with a bit of patience. Tomatins often take a while to open up anyway. What's good about it - Fruit and tobacco, wood and wax. Juicy and compelling with a lovely, structured, tannic finish fizzing with fruit and cask. It's a cracker. Nose - Deeply sweet, tropical wood, cherry tobacco and citronella. Pineapple, BBQed pork and bamboo skewers. Summer perfume. Very much like a night on the beach. Beautiful and evocative. Body - BBQ competitions (that's mainly pork fat, paprika, smoke, salt and apple juice), tobacco (leaf and smoking), fruit (more pineapple, some toffee apple) and honey. Finish - Very long, sweet, with dusty pepper and lots of structural tannins and sulphur again. A small, retronasal, flowering of peat. Just a touch of youth in the cereal in the finish, a small flaw in the decadence. What's not good about it - bah - very little, except some youth. Lovely stuff. What's good about it - Slightly weird and funky - tropical and Asian - as well as being great Scotch and doing the Tomatin thing of being understated, but unputdownable and excellent. I love it. Buying a bottle of this.